← I saw a hawk land by my goldfish pond yesterday! The goldfish pond that my hubby built for me is a great joy for me. (You can do a search on “pond” and see how much I talk about it here.) But, from time to time we have to work on it. Lately, we’ve had a problem with grass tendrils traveling to the pond and growing into the water. The edge of the pond can get quite bushy. It looks icky, so we have to pull the grass out. The grass gets in between the rocks, so it’s hard to pull out. At one point, we had a mulch yard around the pond, and we had used these to outline the mulched area and make a pathway through it. The mulch was to keep the grass from growing around the pond. It only worked a little while…..The Bermuda grass took over and it grew right through the mulch. So, we are back to the drawing board. Here’s a picture of how it looked when the grass started taking over the mulched area. You can see the stepping stones, and also the edging bricks between the lawn and the old mulched area. So, this weekend, I was outside pulling weeds around the pond, again. I thought, there’s got to be a better way! I brought a proposal to my hubby to build a “shoulder” of some sort, a buffer zone, between the grass and the pond. I told him I thought we could reuse some materials we already had to make this shoulder. Remarkably, (tee hee) he liked my idea. Once we decided to do it, his job was to figure out how to do it so it worked the way we wanted. We sat down and planned what to do. With our new idea, we will let our lawn go all the way up the the edge of the shoulder. So, we picked up up all the stepping stones and edger bricks and stacked them up out of the way. Also, my hubby “scalped” the grass off of the mulch area, and mowed up a lot of the mulch, to get it back down to the level of the rest of the lawn. That was a job right there! Just ask my hubby. It was a lot of work bagging grass clippings in a relatively small area. Besides that, we calculated quantities and went and bought our materials. It was quite a lot of hard work for my hubby to load and unload all the sand bags, so I’m not sure when we are actually going to start working on our project, but at least we have all the materials ready. Remove the rocks from around the edge of the pond. Install narrow sheet metal flashing vertically as a physical weed/grass barrier just outside the two feet. Spray weed killer on the shallow trenched area (carefully! We have lots of pets). Line the shallow trench with 6 mil plastic liner. Fill the trench with two inches of sand. Lay the stepping stones in the sand. 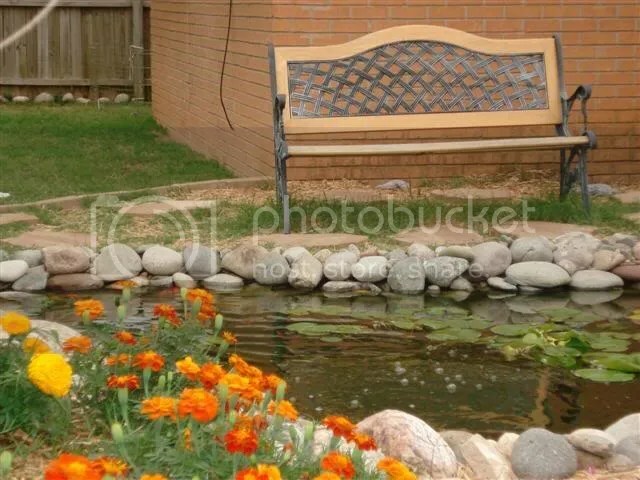 Put the medium sized rocks back around the edge of the pond. Fill in the spaces between the medium rocks and stepping stones with small rocks and gravel (left over from making the pond). Line the whole shoulder with the edging bricks for a mow edge. It’s going to be a big job, but we don’t ever want to pull weeds out between the rocks lining the pond any more. It will save us a lot of time and work in the long run. The nice thing, is that we don’t have to spend much more money to make this, since we are mostly re-using materials we already have. 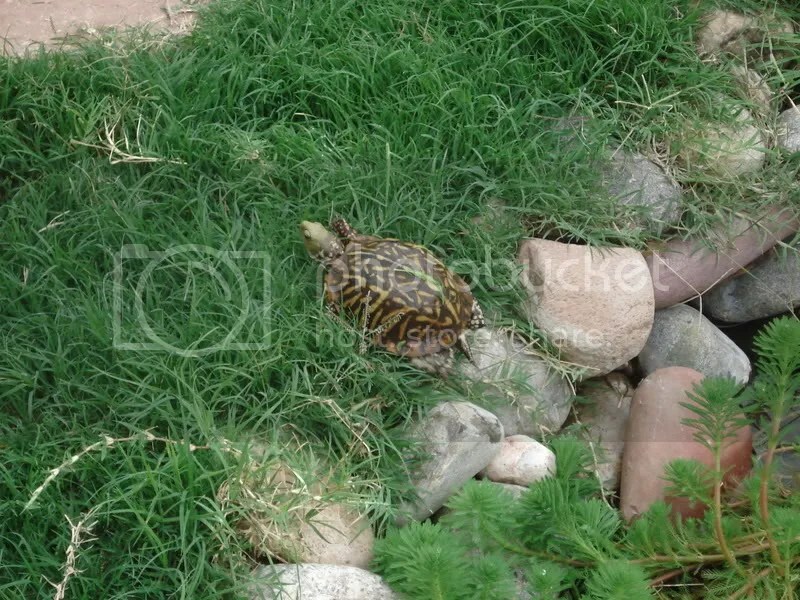 PS: I just was surfing my space to see how often I talk about the pond, and I came across a picture that shows the edge of the pond, (and my turtle Timmy!). This site is about books I read and things I learned that convinced me that God exists. Edited by John F. Ashton PhD.